Come June 9th this appalling General Election campaign will be over. 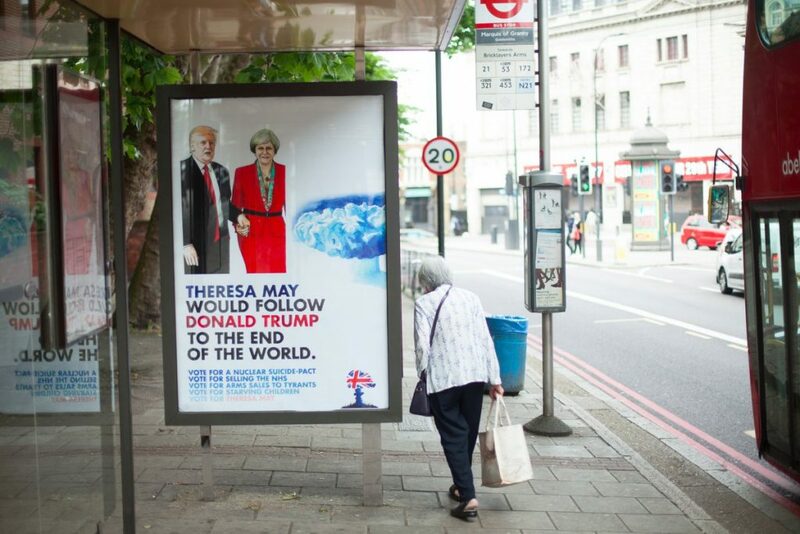 Nothing will have changed except, as the poster says, Theresa May is even more eager to follow Donald Trump to the end of the world and that leaving the European Union and the Paris agreement on carbon emissions are the two biggest common-sense reversals undertaken by Western leaders since the invasion of Iraq in 2004. The confusion most people feel is a deliberate policy construction by the British State to obscure what is actually going on. As a purely Machiavellian tactic this would be understandable, but when senior members of the “natural party of government” continually display that they do not have much clue as to what is going on either, then it is time to get out the worry beads. However, even if the Tories lose the election, which is unlikely, the British State wins. It is designed to stay the same no matter what happens. Its stability is its selfishness and this permanent arrangement of injustice and division has certain guarantors. One is the subservient relationship Scotland continues to have with England in the British Union. The reason the Tories, Labour and Willie Rennie’s support group have been obsessing about a second Scottish independence referendum throughout this election campaign is that they are genuinely terrified of it. Which is understandable for the Conservatives, as they have fetishized the Union to the centre of their behaviour, but historically it makes no sense for the Scottish socialists and Liberals with their traditional support for “Home Rule”. But once Unionism takes over a political party historical memory and purpose goes out of the window. Perhaps one of the reasons the Brexit issue has figured so highly in this election campaign, but at the same time made no real difference to the outcome, is that people have no idea what it really means? Like an invisible gas no-one can see it or smell it or taste it. Many people, quite rightly, fear it. Others, because they need to believe in something, welcome it. Either way, on the Brexit front, confusion reigns. That is the way the Conservatives like it, that is until they have prepared their public and press statements to take all the credit for the success of the negotiations, or they can apportion blame for their inevitable failure. Either way, they are determined to win. Similarly skewed is the Tory insistence, backed loyally by Labour and the Lib Dems, that an independent Scotland would be an economic basket case. This is purely an expression of faith on their part, coupled with a good deal of fiscal fixing and boxes of beads and feathers for the Caledonian natives. This is never more apparent than when it comes to the North Sea. So, Big Oil runs America. What is new? So, Donald Trump is even more of a dangerous dummkopf than we Scottish lefty-liberals thought. What did we expect? For the world, the most dangerous thing about the new American regime is that Rex Tillson, the sabbatical taking CEO of Exxon Mobil, is the US Secretary of State. The Paris agreement on climate change was burned carbon as soon as he took up office. That is one side of the reality, but it is so far away from Scottish shores to be as good as abstract, but it is another power guarantor for the British Tories. What isn’t abstract, most definitely concrete and steel, is the North Sea. Yet to most people, other than to the 300,000 or so who are employed directly or indirectly by oil and gas production, the North Sea oil field might as well be abstract because, like Brexit, they can’t see it. I can see the Beatrice Alpha production platform from the Caithness coast but for the majority the oil field is far away, offshore and unknown. The Tories like to bleat on about the falling price of oil, as if it were an act of nature, and how this, somehow, makes Scotland poor. Oil fell from its peak price a few years ago because of the actions of several key players in an oil and gas trade war: namely the USA, Saudi Arabia, Russia and Iran. To over-produce when demand is falling, such as the Saudi’s have done, is deliberate and considered foreign policy, a direct political act. The effects have been felt around the world. None more so than in Scotland, where the falling tax take in North Sea oil revenues, the unionists claim, makes Scottish independence impossible. For the past tax year, the Westminster Treasury received £500 million from the North Sea. The oil price fell by 55% and even though production rose by 16%, oil revenues from the oil field fell by 99%. The Norwegians, over the same period and from a smaller oil sector, raised £17 billion, which is down by 40% from last year. The word for this, when it comes to the UK oil sector, is mismanagement. The government would call it “tax breaks”. Whether it is Tory or Labour the gift to the oil companies keeps giving. The UK gave Shell, for example, around £80 million in tax relief. Shell paid the Norwegian government £2.7 billion. In 2015 Shell cut 13,000 jobs in the North Sea and paid the Treasury zero in corporation tax. In 2016 Shell paid out over £11 billion in dividends to its shareholders. It’s the same sad story over recent years with BP and other oil companies. If this isn’t asset stripping of a nation’s natural resources, at the expense of the people’s economic security, I don’t know what is? It doesn’t stop there. The North Sea is full of ageing production structures and oil fields past their peak. According to figures released by Wood Mackenzie, the oil and gas data research and analysis company, North Sea decommissioning costs are forecast to exceed £50 billion during the next forty years, with almost half the liability to be met by the UK Treasury through tax relief. Whether you call this a generous incentives package by a government to keep an industry sweet or aggressive avoidance by oil companies, it has the smell of collusion and corruption about it. Make no mistake, at a time of austerity, cut backs and Brexit blathering, it is the people of Scotland who are subsidising the extraction of their own natural resources, rubber stamped and facilitated by a UK government who constantly tell us we are too poor to manage our affairs on our own. Not even Donald Trump, on his grandfather’s old floating, leaky Yukon brothel could mismanage them more comprehensively. If you doubt the figures just look up the Tax Justice Network for yourself. What Brexit means – the idea of it rather than the yet unknown reality – is that the British State plans to go on in this fashion for the foreseeable future. It’s not just oil or climate change denying that are state guarantors of power – there are others. The huge and repeated resistance to any form of change to land ownership in Scotland, especially in the Highlands and Islands, by the British State is evidence of this. These vast sporting estates consolidate power in the hands of the few and stifle meaningful economic development and human potential. The landowners will tell you it is not the ownership that is important, but successful land management. In that case all Highland estates are failures because the legacy of their “management” is that the Highlands are kept artificially empty of people. The more the Conservatives talk of change and opportunity, as they have done since the EU referendum, the more they mean the enrichment of the minority and entrenchment of a zero-hours economy for the rest of us. “Jupiter and Semele” Painting by artist Pietro della Vecchia (mid 1600s). Last week the usually reliable and personable Guardian journalist John Harris made a ten-minute film about the North East of Scotland, driving around from Aberdeen to Elgin, Peterhead to Peterculter, interviewing people as he went along. His film, unfortunately, was a compendium of confusion, which was not his fault, I would suggest, nor the fault of the people whom he spoke with, who ranged from fishermen to buskers, oil workers to shop workers, but a reflection of the deliberate confusion the political parties and the media have created in people’s minds. When ordinary working people tell a passing journalist that they are going to vote for the Tories because they are fed up with the SNP, who “have done nothing”, then you know there is something deeply wrong with the way political information is given out. This is why Theresa May has shied away from real debate for the length of this General Election campaign. In times of trouble it is always advisable to turn to Ovid for some clarity. In the story of Jupiter and Semele we might find a clue as to what fate awaits Theresa May at the hands of The Donald and his band of his oil burning Republicans. Jupiter, through cunning, has made the beautiful, innocent nymph Semele pregnant. Juno, Jupiter’s wife, goes to arrange a punishment for Semele, disguised as her old nurse. She convinces Semele that she should summon Jupiter to her, so that he appears in the form that Juno, his rightful wife, sees him. Once so summoned Jupiter is bound to do this and unfortunately, inevitably, his thunderbolts render the poor Semele to ashes. This “flaming truth” from Ovid’s myth awaits us all if we lie down and let the forces of reaction trample over us unchallenged. What we must realise is that despite their bluster, their fanfares and media sirens, they are incompetent, corrupt, weak and that they will not prevail. Whatever happens on Thursday, only our independence from the UK will ensure that we don’t get burned.